A big dinner favorite at our house is Fondue Night! I love preparing it because it's so simple, yet such a satisfying, and fun meal. And, everyone in our family loves it. We love the experience. And, we love the taste. 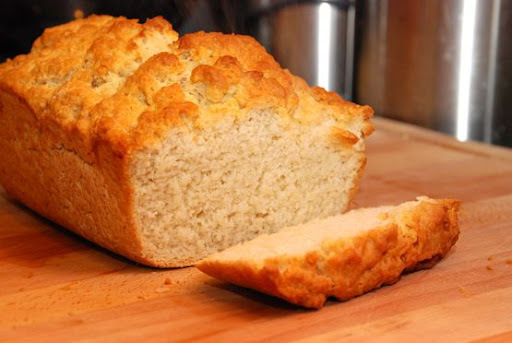 I start off by making a loaf of Homemade Beer Bread. Sometimes I make it earlier in the day, and sometimes I make it an hour before dinner. 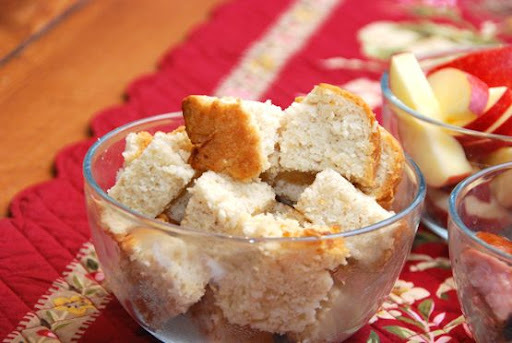 Beer bread is great with fondue because it is sturdy enough to hold up to dipping. Then, I cut it into cubes. Next, I make Cheese Fondue. I love this recipe - the beer base adds great flavor to the cheese and the garlic powder is just the right touch of flavor. But, you could use white wine or chicken stock if you prefer. The recipe is below. 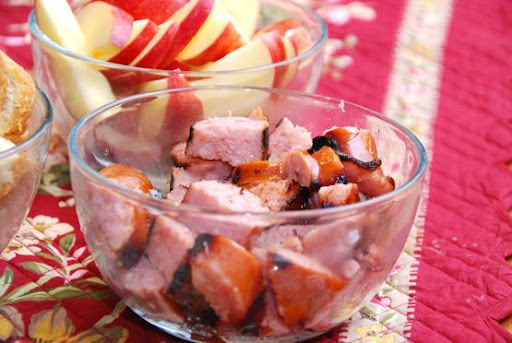 I cook one pound of Kielbasa or smoked sausage on our outdoor grill or indoor grill pan. After it cools slightly, I cut it into small chunks. 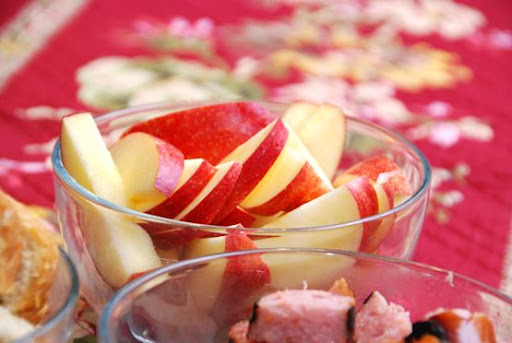 Lastly, I cut apples into slices. All of that (besides the bread baking time) takes me less than 20 minutes. That makes this perfect for a weeknight meal! I put everything in simple glass bowls. Easy! 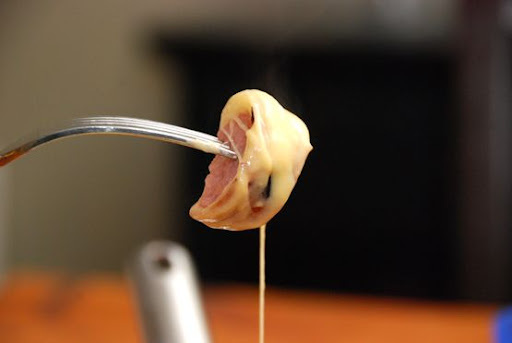 If you have a fondue pot, you could transfer the cheese fondue to the fondue pot and put a low heat under it. 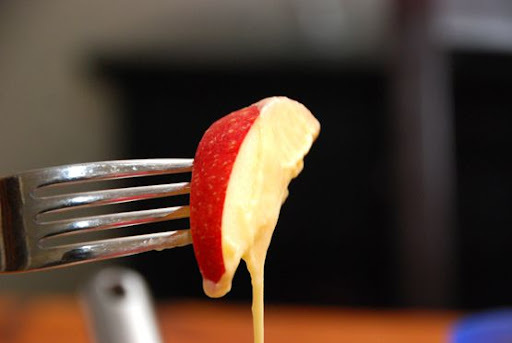 But, this cheese fondue will stay soft for over a half hour even without heat under it. And, on a weeknight, I just leave the cheese right in the pot I cooked it in. It makes for easy clean up and I'm all about easy cleanup! And, then we begin dipping. And, one of the BEST things about this meal is that my kids love it as much as we do. It feels upscale and Melting Pot-ish to my husband and me. And, it feels like McDonald's fries and ketchup to my kids. 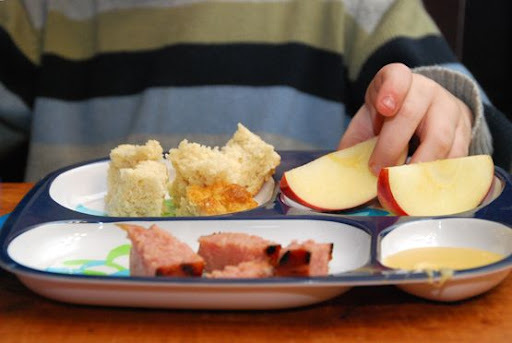 These (sausage, bread, apples) are the "dippers" we like - but you could use french bread, grilled chicken, steak, vegetables - that's totally up to you and what you like! 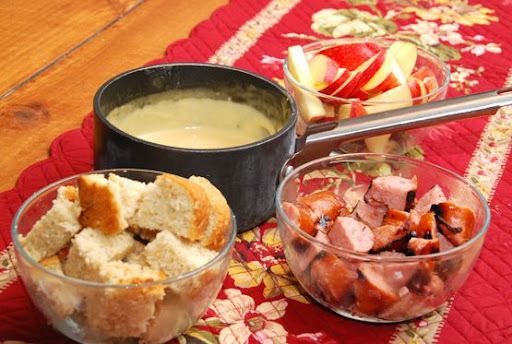 SO, next time you need an easy, fun weeknight meal idea, try a Fondue Night. Melt butter in small saucepan on medium high heat. Add flour, salt, and garlic powder and stir with a whisk until it forms a thick paste. Add beer, wine or chicken stock. Heat until just boiling. Turn down heat to low, and add cheese, a bit at a time, stirring constantly until melted and creamy. Turn off heat. 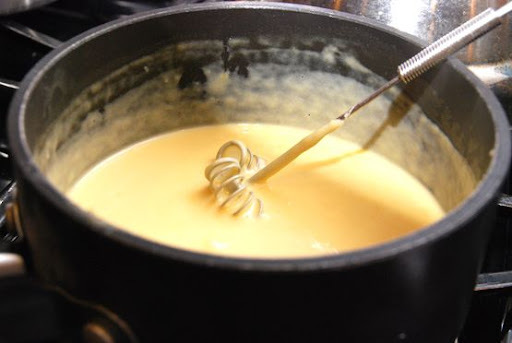 *If desired, transfer cheese sauce to a fondue pot. 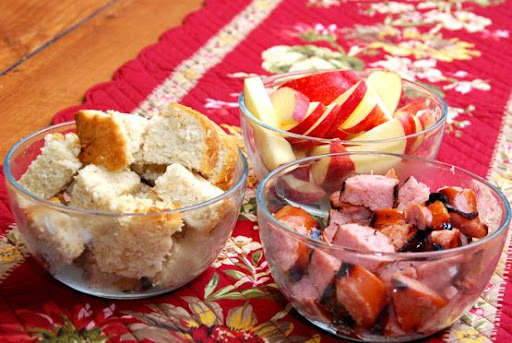 Serve with bread, sausage, and apples - or the "dippers" of your choice! *This cheese recipe serves about 4. Double or triple depending on the size of your family or how hungry you are! looks fantastic! 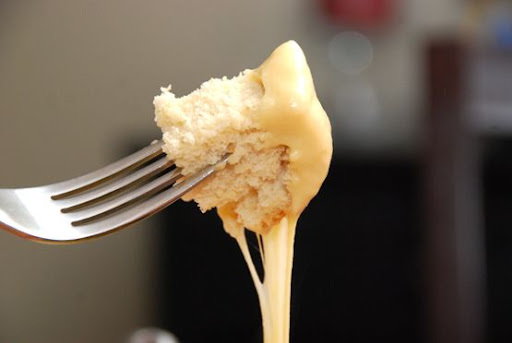 we love our cheese fondue. and the close-up pics turned out great! Oooohhh...yum! What a great idea for this fall weather. Guess what I'll be making for dinner tonight? Thanks for the great idea! Oh yum! Sounds like a fun, fun meal! I knew you would not disappoint dear Sarah! I can't wait to try this with the circus crew. Sounds delicious and super fun!! Just wanted to pass on this article in case anyone has concerns about too much alcohol for their children. That is why I included substitute options - for anyone who might not want to use alcohol, for religious reasons or otherwise, in both of these recipes. I, however, have no concerns whatsoever about the amount of alcohol that might be left in these recipes after the cooking process has taken place. I feel entirely comfortable serving both this beer bread recipe and this cheese fondue recipe to my family, including my children. Oh, yeah. My kind of comfort food. Sounds delicious and fun. I'm going to try it real soon. I cannot wait to try this with the family, Sarah! All of it looks awesome -- and thanks for the beer bread recipe too! Just wanted to let you know that I made your Beer Bread last night and I think my husband ate 3/4 of it after I went to bed LOL. Needless to say it was very very good!! Can't wait to try this dip! And just today, I saw a recipe so similar to your beer bread using ginger ale, like you said. Think I'll be trying this soon! We LOVE dipping over here! And dipping into a cheese dip? What's not to love! made this tonight. yum! I think I will use less salt next time. Fun, easy, and great for using up leftovers. This was the best at home fondue I've ever made!! My family loved it and its as soooooo smooth and creamy. I just substituted a large tsp of fresh garlic for the powered garlic and we used medium cheddar cheese, but other than that it was exactly the same. Thank you!! This will be a regular dinner at our house, it was a hit! !